A paper submitted for peer review by the Berkeley Earth Surface Temperature study (BEST)finds that urban heating has an influence on global temperature trends that is “nearly negligible” and that what effect has been observed is even slightly negative, which is to say that temperature trends in urban areas are actually cooler than the trends measured at rural sites, and that the Earth’s land surface has warmed approximately 1°C on average since 1950. It has long been observed that temperatures in cities are higher than in the surrounding countryside, caused, in part, by human structures that reduce albedo and evapo-transpiration, as well as by the effects of waste heat emissions, McCarthy et al 2010. Even though most (99%) of the Earth’s surface is not urbanized, some 27% of the Monthly Global Historical Climatology Network (GHCN-M) temperature stations are located in cities having populations of more than 50,000. Since urbanization has grown dramatically over the past few centuries, it seems reasonable to ask how much of the observed rise in global temperatures is due to urbanization. For example, McKitrick and Michaels claimed in 2007 that about half of the recent warming over land is due to urban heat island effect, although this result was disputed bySchmidt in 2009. Several studies have looked in depth at possible heat island contamination of land temperature records. For example, Hansen et al in 2010 used satellite measurements of night lights to remove possibly affected urban sites from the temperature records. Allowing for urban effects reduced the global temperature trend over the period 1900-2009 by 0.01°C. Menne et alperformed an analysis on US surface temperature records and found only very small effects due to poor siting of temperature stations. They reported that poorly-sited stations did show some small positive bias in recorded minimum temperatures but there was a small, but slightly larger, negative bias in recorded maximum temperatures, resulting in an overall small residual cool bias. The BEST project has the goal of merging all of the world’s temperature data sets into a common data set and of using new algorithms to analyze and filter the data. The BEST archive has 39,300 stations, some five times the 7,280 stations incorporated in the GHCN-M data set. The BEST study has been fiercely criticized for accepting funding from the Koch Foundation, for the allegedly biased views of the project’s founder Richard Muller and the choice of the controversial Judith Curry as the sole climatologist on the scientific team. The BEST paper reported on here focuses on urban effects on the temperature record . It was authored by Charlotte Wickham, Judith Curry, Don Groom, Robert Jacobsen, Richard Muller, Saul Perlmutter, Robert Rohde, Arthur Rosenfeld, and Jonathan Wurtele and is titled Influence of Urban Heating on the Global Temperature Land Average Using Rural Sites Identified fromMODIS Classifications. The temperature stations were sorted into two sets: a complete set and a set comprising only stations located far from urban areas. The authors used a satellite-imagery derived map made by the MODIS project that can distinguish between urbanized areas and rural and undeveloped areas. In order to allow for the imprecise coordinates of some of the temperature stations compared to the fine resolution of the MODIS map, the BEST authors defined the stations as either “very-rural” or not. Very-rural sites are located at least one tenth of a degree of latitude or longitude (about 11 km) away from the urban areas defined on the MODIS map. The BEST study performed two analyses. The first looked at simple trend analysis on their raw temperature data, with the seasonal effects removed. 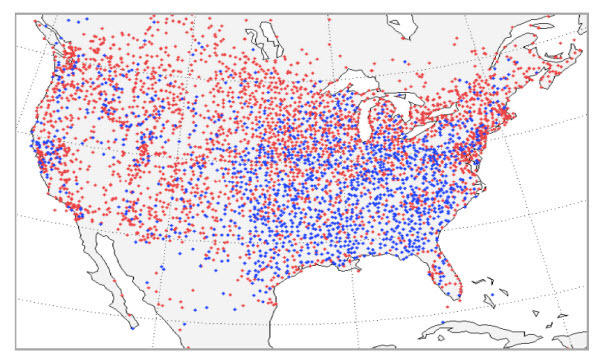 Figure 1: Temperature trends for all 39,028 temperature stations (left) and for the 16,132 “very-rural” sites (right). About one third of the stations showed cooling and the rest warming over their periods of record length. The histograms all show similar average warming trends and the stations with the longest measurement durations show the least dispersion of temperature trends. The median trends for all the sites range from 0.98°C per century for sites with more than two months of observations and to 0.97°C per century for stations with record lengths greater than 30 years. The rural stations medians are 1.08 and 1.09°C per century respectively. The rural stations therefore show more median warming, about one tenth of a degree Celsius per century, than the complete data set. This result is counter-intuitive and is at odds with previous studies that showed a small but positive urban effect in the range of 0.01 to 0.1°C per century. The BEST team offers no convincing explanation of why this should be so. One third of the records lie to the left of the zero warming line. Figure 2 illustrates how the warming and cooling sites are distributed over part of North America. Figure 2: Locations of temperature stations with more than 70 years of data. Red dots show a warming trend and blue dots cooling. The map illustrates the importance of having multiple records to detect climate trends. BEST’s first approach does not account for unevenness in station distribution, nor is consideration given to the different time periods over which the data were acquired. In their second approach, the BEST team performed a global land temperature reconstruction with their own methodology, using all the data and the very-rural sites only. The details of the methodology used are described in a draft paper by Robert Rohde and others. The results (Figure 3) show very little difference in the post-1950 period between the very rural stations and the rest. 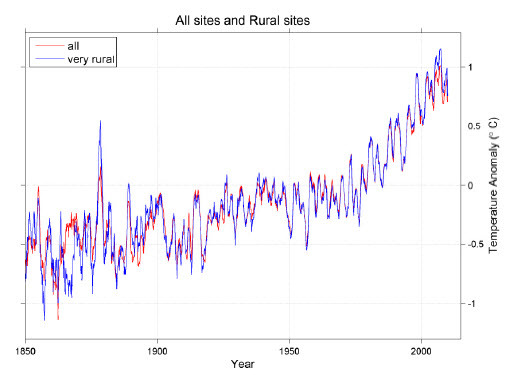 In fact, in the most recent few decades, the rural sites have become slightly warmer than the full data set, and show a trend of -0.19 +/- 0.19°C per century over the 1950-2010 time period, roughly consistent with the trends reported in the first method. The observed warming since 1950 is 1.9 +/- 0.1°C per century, ten times larger than, and of opposite sign to, the urban-rural effects. Figure 3: The Berkeley Earth global temperature averages, normalized to zero mean for the period 1950 to 1980. The main result of this study, that the influence of urban areas on the global land temperature data set is very small, corroborates the consensus view among climate scientists, including, for example, the recent paper by Souleymane Fall and others. To the extent that the BEST work resolves “current criticism of the former temperature analyses” it succeeds, even if the results come as no surprise. Nevertheless, initial reactions from certain quarters indicate, also unsurprisingly, that they are unhappy with the outcome of this and other recently released BEST studies. For example, Roger Pielke Sr comments that: “The nearly identical trends is no surprise as they draw from mostly the same raw data!” The BEST studies however, as mentioned earlier, have used all available temperature data, 39,300 stations, some five times the 7,280 stations used in the GHCN-M data set. The results of the BEST study are indeed unsurprising because the previous data sets sampled all the data adequately. Other objections have been raised that the BEST studies were released prior to peer-review. That is indeed true and it will be interesting to see if the methodology and conclusions in these draft papers are significantly modified during the review process. It’s worth emphasizing that the study looked at the effects of urbanization on the global landtemperature trend. Once ocean temperatures are considered the small urban influence on temperatures will be further diluted. the influence of the urban stations on the global record is very small and, if present at all, is biased on the cool side. This entry was posted in Hard Science. Bookmark the permalink.